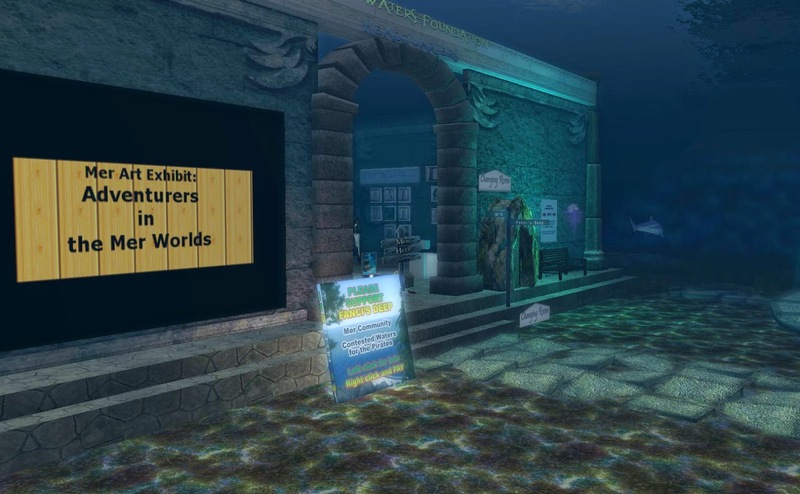 Among the sponsors of the upcoming Fantasy Faire is the "Safe Waters Foundation," a group promoting merfolk and their communities in Second Life. Their founder and leader is GraceSWF Wrigglesworth, also known as simply "Grace." I recently went to have a chat with her. I accepted a teleport to a location high in the air in Union Passage, the same sim where the Safe Waters' HQ is. Grace was a little different from most merfolk in that her tail resembled a shark's instead of the scaled fins many have, "Well, given your size, let's sit over here," she suggested. And we went to a certain spot in the building. "So this is your office?" I asked her? "It's like a private area," Grace told me, "was a build from one of the Second Life party events. I loved it so (I) asked the builder/volunteers to put it up here." Grace explained why, "People are so fascinated with mermaids and such, that there are constant interruptions when trying to do the work to keep things moving. So this is up high - hard to find and harder for people to listen in. So I can speak openly." "Thank you so much for honoring me with this interview," Grace told me, "and honoring my difficult schedule." I told her no problem. I asked how she came to Second Life. Grace told me, "Well I was very active in chat groups, AOL, MSN, and heard about Second Life somehow probably a person told me, and just loved the idea. (I) came in as human of course, joined the Avilion sim ... They have a merrow group. I saw the mermaid signs here and there, and one day a mermaid swam by. I thought, 'Wow, she flew fast through the air.' I scrambled to keep up with her, and eventually found her to click on her. She started me, isn't on much now. (I) miss her too." Grace told me she was "quite active at Avilion merrow, and shifted to a larger focus on the community as a whole." She had nothing but complements for Avillon, suggesting the Newser write about it later, "for people who like roleplay and multiple species medieval, its a wonderful sim. I adore dragons." She showed me a picture of her pre-mer days, "there I am before I molted," she told me, her term for when she changed to the type of avatar she now wears. Noting my furred appearance, she brought up, "there are mer furs in Second Life, furry upper half. You could try being a mer, and stay furry if you wish. Lots of lower halves. Mine just happens to be shark - but we call the entire package a mermaid, or merman (as) we call (the males)." I asked her what inspired her more sharklike look. She answered, "Well ... when I started there were not a lot of choices and they were hard to find in Second Life. I first sort of accepted myself with black tails. But when I found this one - oh a year ago at least, I told people I molted. This is my true self. I don't change tails all the time. Many people do, sort of like outfits." Grace told me she hadn't started any of the other merfolk groups, but instead had been "trying to encourage special interests of mers, to support their development." They included a warrior group and a "Midnight Seas group for mers in non-American time zones ... they are still really struggling to find each other. ... I help if they want and if I can." She did have some help, "We have a Board of Directors. Really, a LOT of people make SWF happen, but I started it. ... am sort of the shepard." Even though it has a board, Grace felt the organization was "not formal." So when I asked for how many groups were a part of Safe Waters, she answered, "that number would be hard to come up with. ... I offer to every mer group that asks about advertising her or for us to do announcements. ... Many don't even know I watch and try to help." Others that were a part of the Foundation included "Fancy's MerFurs," "Antiquity Merfolk," "Ceteceans" - a group for whale and dolphin avatars, "Petite Mer," and "Sea Dwellers." Grace felt, "I think the first major breakthrough we had was when the group started to grow! Safe Waters Foundation! The chat became like a social network. The worst thing for mers is they couldn't find each other. And we've just gradually added things. ... Lots of builders have stepped up and donated their time and talents, as have other volunteers, LOTS of them!" She went on to say some came forward just to take on a particular project, "I'm good at .... empowering others to explore their talents." Grace went on, I" don't want to .... encourage anything unhealthy. You know? Balance is key. In our charter you will find a list of values. We try to keep that the spirit of things. ... The officers volunteer mostly if someone does a project or two. If they go well and the leader leads (even if the event or project failed), an officer or myself will nominate an officer. The board votes after open discussion. One no vote and they aren't invited. (It) brakes my heart at times - but there have been some key people I've not been able to invite. (There is) no formal written description of that. It is more ..... like a plant, organic. But (it) has kept the board centered I think, and it's not me running the show, not based on my personality, although really it is lots of my life principles in what SWF does." Grace mentioned an episode of "Designing Worlds" in which Fanci's Deep and the Safe Water Foundation were the subject, "it takes like 40 minutes to watch, but is the history of Fanci's Deep which is another major breakthrough in the mer community that has really helped. For Fanci's Deep - I'm the liaison mer for that sim. I give a long interview there, and you meet Aley. Aley is a very key figure - she's not been online much for awhile. (She) will only make things for free, will not talk voice, but she linked up the owners of this sim and me." I asked if this was Aley the noted builder of Second Life, whom the Newser has written about a few times. Grace mentioned, "Yes. She had the vision. I'm so sad she's not been around for awhile. Maybe she needed a break." I asked her, "Has this been the longest she's been offline?" Grace answered, "As far as I know yes." She went on about her, "Oh just can't say enough how much we want her back, for her humor, her honor, her honesty, her generosity ... so if you ever speak to her, or get messages to her, she has 200% of my loyalty and support. She has done miracles here. The owners Mark Twain and Nber Medici of course are part of it. But I think she gave the idea to them (pirate ships on top and mer community below) and SWF to anchor it so to speak." Grace told that there was one concern, "as our goal is to foster communication amongst the mer community, I was a little worried bout SWF being seen as favoring one mer community over another. But I think we achieved it by keeping the focus of the overall umbrella of mer community in Second Life. We support all mer sims, and designers, as we can, and if they want of course." She went back to Aley, "she is the heart of this place. You can see the beauty she created in the video." The video showed Fanci's Deep as named for Fanci Bebbe, who passed away in 2013 and had a memorial set up in her honor. Grace mentioned the upcoming Fantasy Faire, "We are a sponsor at Fantasy Faire this year, for the benefit of the Relay for Life ... the Fantasy Faire will include a mer area this year. (It's) kind of interesting, it crosses two of their sims, with swimable waters. I'm excited - FF has been great to work with." The Fantasy Faire mentioned Franci's Deep on their website recently. Grace mentioned they've been doing some advertising, "Everyone is a potential mer, so we try to do marketing outside the existing mers, in addition to fostering communications amongst. And then (the) new campaign we are just starting is Save Our SL Seas." She mentioned their Headquarters had some ad spaces available, We offer the adboards very very cheaply so owners can keep the info current. It was awful trying to keep notecards up to date. That is how we started sharing information. Now we suggest people stroll the headquarters and click on adboards. I mean - who can't pay 25L a week? And funds go to our SWFAccountant and used for SWF projects It's like a mer catalog, though many just won't advertise - want me to give free space." I switched to my Anthroxacty anthro shark about this time, which got Grace's attention, "Oh look at you!!! Lovely." She mentioned "Tithis offers something similar," calling it Tideborns, "we'd love to get them to put up adboard downstairs, those have been a huge breakthrough." Grace then invited me to see their "transformation center ... it is so hard working with people trying to transform." I asked about it, and she told me, "we've been calling it the changing room, (but) people seemed to think it was for people without homes to change, which is fine if used for that. We wanted newbies to have one place to find everything needed." She then began swimming, "let me take you to the normal old entrance. (It) was terrible trying to tell them how to get there too. So I took (our) landmark and renamed it our 'Transformation Center' *giggles* "
We headed to Union Passage (166/231/4), appearing in a building. "This is our headquarters," she told me. We were next to a desk with a cube, "New Mer start here," which had a notecard for newcomers to the place. Grace went on, "across from that desk is a wonderful concept: transformation kits. You can buy for 10L, keep in your inventory, and give to a newbie. I don't always have time to stay and help. So I wanted to have those, and thought might as well make them publicly available. Anything to make it easier to try mer." We went up to a board, Grace saying, "Here is information on Fanci's Deep under the sea." Then we went out to the front of the building to what looked like a wooden door under a rock arch at Union Passage (177/227/1), "this is the changing room." Clicking the door open revealed a teleporter, "click again to go up." We both went up to the location, which had two rooms with posing stands and closeable curtains. On the other wall, there were two freebie tails, a blue one for males, a pink for females, and instructions for wearing those. Grace stated, "Many mer stores offer free mer tails as a major promotion tool. So we try not to compete but are trying to increase the size of their markets. But some ..... have some friction there, I know. It's all about balance." Grace mentioned the "major officers with SWF are Cynthia Main, Zohee Goldshark and Celtic Infinity. (I) call them senior managers. I think you can see the other officers in the group if you join. They work a LOT. She also mentioned Wlfric Gausman (Wulfric Foxdale), "created an entire sim and put SWF HQ into the middle of it. That was our first involvement in a sim. He was so gracious (Wlfric was) when we were offered the opportunity to move SWF HQ to Fanci's Deep. We make a good anchor for mer. Anything you can do to help people find the mer option would be appreciated. 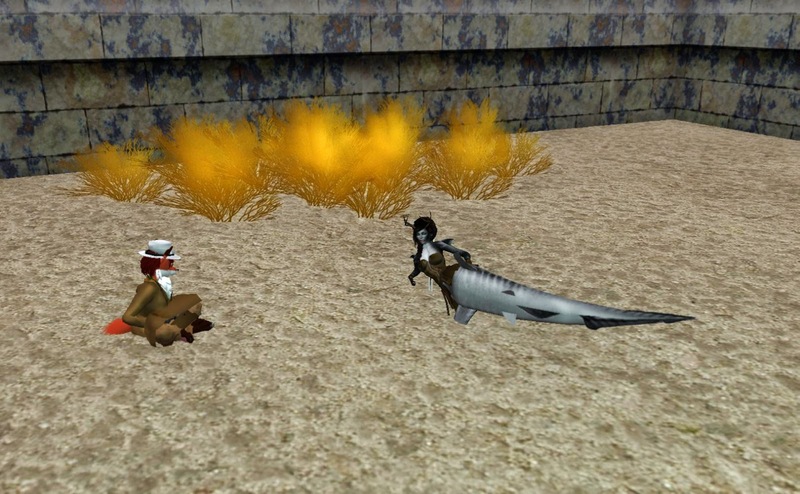 I think people are not aware of the awesome underwater side of Second Life." She suggested one place to check out, Two Moons Paradise, "they bring a lot of mers into the world, huge supporter of Fanci's Deep ... they have land and underwater sections, a lot of international involvement." It was about then that Grace had a meeting to go to, and we swam our separate ways. 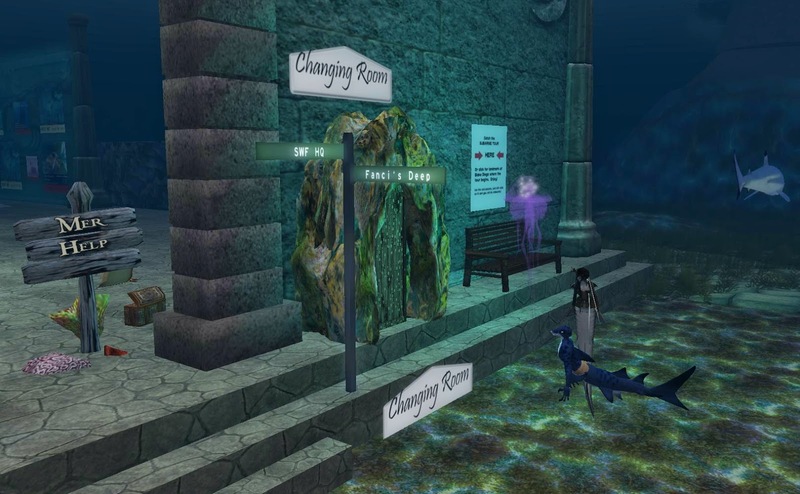 So if you're interested in joining the merfolk of Second Life, even if for part of the time, the Safe Waters Foundation is a place you can go to with a number of groups under them with various themes, and an ocean to swim around in.